Happy writing my friends...I didn't make it all the way around last week...but this week I shall! Shame you couldn't complete the rounds last week. Oh hahahah this was a fun one Tess! Cheers! I was all set to dismiss this photo as a tiresome steam-punk jape. That's how jaded I am. And I wanted to prove, to myself at least, that it was a fake. Well, it seems my curiosity ended up getting the better of me this time, because this daguerrotype is very real, ca 1850. 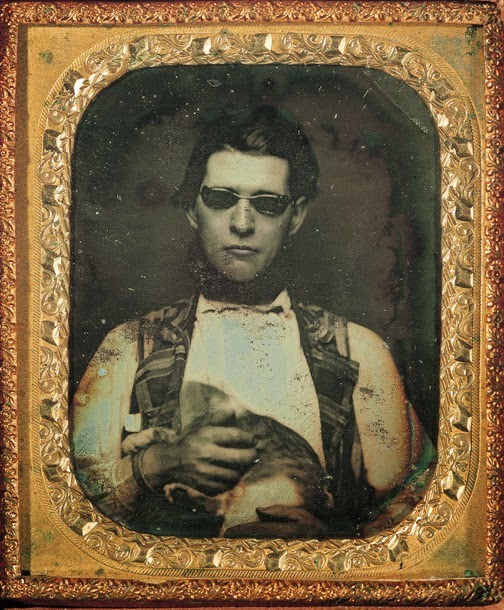 Portrait of a blind man holding a cat. well I'll be dmnd! Thanks for doing this research. Makes me wonder what HIS story was! Just a 'quickie' this week, Tess. Enjoyed the challenge on this one - put me in mind of a bloke I met in London, who was my sister's best mate at the time. Done..it was another quickie and am so thankful for pictures that makes the ideas flow quickly! Good early morning. Mine is up. Can't believe I missed so many weeks! An inspiring photograph, to be sure. Thanks to Narrator for pointing me your way and thanks for the challenge! Oh I like this hunk of a man, seriously. It's like peering into a love, sadly gone bye-bye. This time it took me 3 days to write for Sunday's prompt. It gave me some problems deciding what to write. Have a good write my freinds! Now that was some tough cookie - I was ages thinking of an idea and it came after a few beers last night. Looking forward to seeing my friends' efforts in the group. Great prompt I look forward to reading everyone's interpretations..
My computer has risen from the ashes. Thanks for the pleasure of your prompts.